Cam position sensor — 7.3 CPS — was one of the first parts I replaced on my 2002 7.3 Powerstroke diesel. The truck had 202,000 miles on it and was a little neglected. So I took out the old grey version—the original black CPS had long since been replaced—and threw it in my glove box as a spare. Let's get this out of the way right away. The "crank position sensor 7.3 Powerstroke" ... doesn't exist. Ford calls it a "Synchronizer" or "Crankshaft Position Motion Sensor." 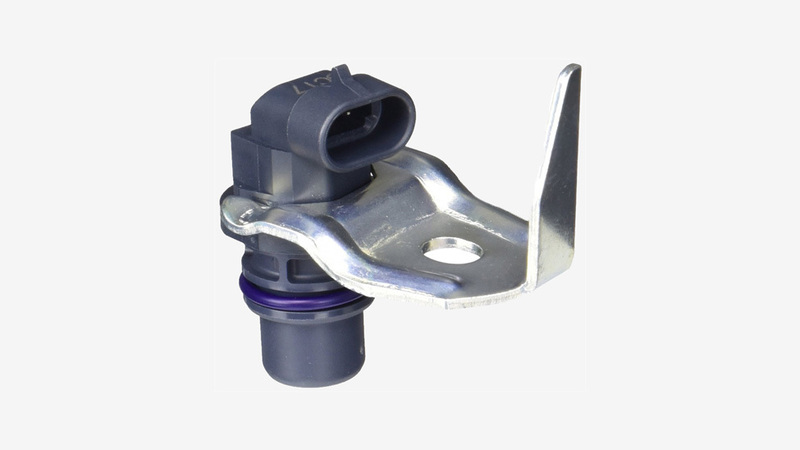 But the more common and accepted nomenclature is 7.3 camshaft position sensor, or 7.3 CPS. To be clear, there are not two unique sensors, just the one — 7.3 CPS. Sorry, no such thing as a "crank" sensor on a 7.3 Powerstroke. Simply put, the 7.3 cam position sensor identifies which cylinder is at top dead center—the combustion stroke. Knowing this allows the engine powertrain control module (PCM) to adjust fuel injection timing to provide smooth combustion to your diesel truck. And that means that it helps your 7.3 Powerstroke diesel engine deliver fuel to the right cylinder at the right moment in the timing sequence. The inserted end of the 7.3 CPS is a magnet. The magnet's job is to sense the spokes and gaps (windows) on the camshaft wheel. Since the cylinder #1 and cylinder #4 indicator windows are narrower and wider, respectively, than the other windows on the cam wheel, the 7.3 cam sensor can tell which cylinder is about to hit top dead center—TDC. Then the PCM can deliver the fuel at the precise moment it's needed. It also helps in adjusting things like RPM to ensure smooth idle and operation of the engine. So, guess what happens if your 7.3 CPS is malfunctioning? Dying at idle over a period of weeks or months can signal an imminent 7.3 CPS failure. Failed 7.3 CPS sensors have left many 7.3 Powerstroke drivers broken down along the side of the road. One minute you'll be driving down the road with no issues and the next your trusty 7.3 liter diesel will simply die. Then your engine will crank but not start. Because if your 7.3's cam sensor is toast, it can't send a signal to the PCM. And if the PCM doesn't know where the cam is in the cylinder rotation it won't send an injector signal to the Injector Driver Module (IDM). Then your injectors won't fire and your truck won't start. This is the exact scenario that has many 7.3 Powerstroke owners, myself included, carrying a spare CPS in our glove boxes. During cranking, the tachometer needle on a pre-2002, 7.3 Powerstroke won't move. A telltale sign that your 7.3 cam sensor has failed. After 2002 the 7.3 diesel's instrument cluster changed and the "dead" tach was no longer an indication that the CPS had failed. Ford's new gray, recall-replacement 7.3 CPS created a very noticeable idle miss. And injector #8 would fail a Cylinder Contribution Test (CCT) with a Diagnostic Trouble Code (DTC) of P0284. So, before you get drastic and replace an expensive injector, swap out your CPS. But non operation isn't the only 7.3 cps failure symptom to watch out for. Because whichever cam position sensor 7.3 symptoms your truck has, a failure may not even throw a trouble code. All of these are symptoms that your 7.3's cam sensor is about to fail. A noticeable "hiccup" during acceleration. You might be able to find one of these around, but eBay sellers are charging a premium for the original black 7.3 CPS. After a lot of failures and unhappy 7.3 owners' complaints, Ford issued a recall—07S57—for the light grey OEM 7.3 powerstroke cam sensor. Ford released the new dark grey/"purple" CPS sensor mentioned above. 7.3 Powerstroke owners found that it provided better idle and increases in 7.3 MPG. This is the one I run in my truck and it smoothed things out considerably. UPDATE: Per comments below this article, the recall may have been a scare tactic to get the "new" CPS with retarded timing replaced and into our 7.3s for "environmental" EPA reasons. The Ford 7.3 Powerstroke cam position sensor location is at 11 'o clock just above the crankshaft damper. It's easier to access the 7.3 CPS from beneath the engine bay on the passenger side. Here's Fordtekmakuloco's excellent 7.3 cam position sensor replacement video on YouTube. Any time you're working on your 7.3 diesel's electrical system, it's a good idea to remove the battery cables. There's a retaining tab on the side of the connector. lift this tab away from the center of the connector a bit and then lift the connector off of the CPS. So be careful because all the plastic in an almost 20 year old 7.3 diesel's gonna be brittle. There are many ways to break a rusted or seized bolt free. Personally, I use some kind of bolt breaker like WD40 Rust Release or better yet, PB Blaster (Amazon Links). After stripping several bolts on my 200K plus mileage 7.3 Powerstroke, I hit most bolts with release before I try to remove them. Spray a little rust release on about 30-60 minutes before you try to remove the CPS bolt. After that, use your 10mm socket and 3" extension or a 10mm deep well with a 3/8" socket wrench to easily break the 7.3 bolt free and remove it. I've read where you should wiggle the CPS back and forth and then pull it out. I don't know about that because I've never been able to do it. My suggestion—20" pry bar and some GENTLE leverage applied behind the little CPS retaining bracket. I think it's more that I can't reach my arm all the way up to the 7.3's CPS to grip it really well and the pry bar gives me the reach. Put a little bit of fresh engine oil around your new 7.3 cam position sensor and simply put it back into the CPS socket. This may take a little wiggling this time, so be patient and go slowly. But you'll feel the o-ring "bump" in and then it's seated. Rotate the CPS retaining bracket so it's inline with the CPS bolt hole. Whether your 7.3's CPS bolt came out easy or hard, do yourself a favor and apply some anti-seize to the new bolt before you torque it back in. You'll thank yourself the next time you have to change out your CPS. Then re-install the 7.3 CPS bolt and torque it to specs—18 lb/ft. Yes, you'll need a small 3/8" torque wrench for this. Push some dielectric grease down into the round female connector on your 7.3 CPS and clip the connector pigtail back onto the CPS. NOTE: during the removal of my 7.3 CPS, the wiring harness broke loose from the cable retainer that was holding it to the water pump. I simply replaced that retainer with a zip tie and clipped the end. The harness retainer is important because it keeps the wiring out of the way of the spinning serpentine belt. Now, reattach your battery cables, fire up your 7.3 Powerstroke, and enjoy!